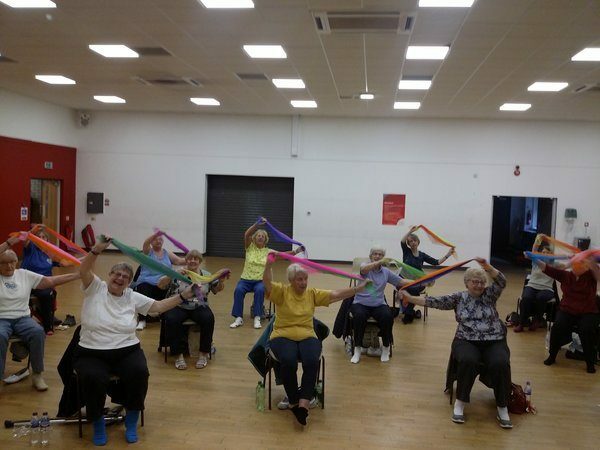 The next meeting of the Seated Exercise group will be on Monday 28th January, 2019 from 2-3pm at Hucknall Leisure Centre. If you haven’t been before and would like to see the group in action, please come along and observe or take part in a free session. It’s a New Year and a good time to consider if you are getting enough regular exercise. Although we can’t stop the ageing process, we can certainly slow it down. So why not give it a go; exercising to some great tracks from the 50’s through to present day in the company of like minded movers. Wear loose, comfortable, clothing and a pair of socks (trainers or soft flat shoes optional) and bring a bottle of water. Seated Exercise will resume this year on Monday, January 28th from 2-3pm at Hucknall Leisure Centre and will continue on the 4th Monday of the month. All welcome and the only equipment required is loose clothing and a pair of socks plus bottled water. Looking forward to seeing old faces and welcoming new ones. What a great session we had. The ABBA tribute songs went down a blast and, in typical female style, we continue to multi-task. Who says you can’t exercise and sing while waving a floaty scarf in the air? It was lovely to see lots of new ladies joining the group and feedback suggested they had a great time and I look forward to our next session to include music by The Bee Gees, so a little Saturday Night Fever may well be in the air. October 22nd will be our last session this year as I am about to be a grandmother for the first time and my son who lives in Colorado and my daughter who lives in London are both expecting babies in November and I’m so looking forward to spending time with them, nappies included. So I hope to resume seated exercise again in February but hopefully some of you will have a little workout at home and keep up the activity till we resume again. 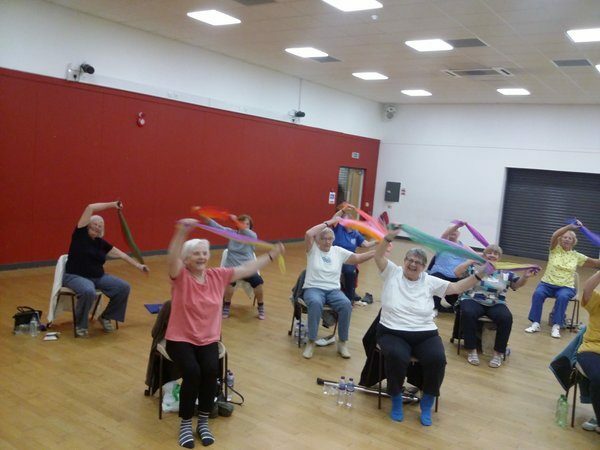 Just a reminder that the seated exercise session is on Monday, 24 September, at 2.00 pm – 3.00 pm at Hucknall Leisure Centre and all are welcome. We are raising the bar a little so please bring an extra two small bottles of water to hold while doing our arm exercises. This is a reminder that there will be no seated exercise class on Monday, 27th August. Our next meeting will be on Monday 24th September at 2.00 pm at Hucknall Leisure Centre. All welcome. Don’t forget to bring two small bottles of water, as we are increasing the work load for those arms, and an ABBA tribute will dominate the musical programme. Look forward to seeing everyone.